The Historic Ensemble of the Potala Palace, Lhasa, represents the apogee of Tibetan architecture and the combination of religious and secular authority. The Potala was the administrative, religious and symbolic centre of Tibet's theocratic government for many centuries. It served as the winter palace of the Dalai Lama. The White Palace was secular in nature (offices and so on), the Red Palace religious. The Potala has 13-storeys and stands over 117 meter high. Within the palace there are many outstanding wall paintings and tangkas. 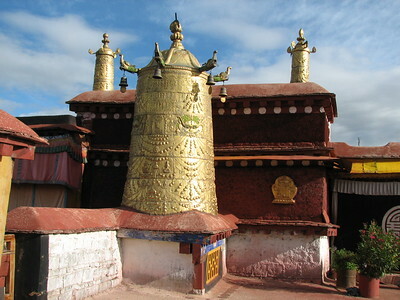 The designated site was extended in 2000 with Jokhang Temple and in 2001 with Norbulingka Summer Palace. The Jokhang is Tibet's most sacred Buddhist temple, located in the centre of the old town of Lhasa. The Norbulingka ('Jewelled Garden') was the Summer palace of the Dalai Lama's since its construction in the 18th century. It had the same functions as the Potala, and thus those two are inseparably linked. It holds among others the residence of the 14th Dalai Lama before he fled to India. 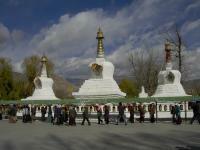 On my first morning in Lhasa I joined the early Jokhang kora, the clockwise circuit of the temple. The pilgrims hold a brisk walking pace, however they take their time to take a look at a good piece of cloth on sale. Inside the Jokhang the pilgrims and the tourists are split - the pilgrims have to queue but can take the walk closest to the statues and paintings. The interior is not an experience for the claustrophobic, it's crowded, smelly and dark. From the roof there are good views of the Potala and the surrounding Tibetan quarters. The Potala itself is the landmark of Lhasa and draws your look every time - and it can be seen from all over the city. I didn't get in, as ticket are hard to come by these days. I did walk a kora here too. The Norbulingka grounds, about 2 km west of the Potala, are a pleasure to walk in. I felt like the only visitor, and got scared a few times by fierce dogs that patrol areas visitors aren't supposed to come. The residences and other buildings here look comfortable. Impressive as this site is, after visiting I felt that the designated area mainly represents a dead culture, the nomination dossier pointing out 'Tibetan architecture' and 'theocratic government'. But it still is a very lively religious site also. And with that comes that sites dedicated to Tibetan Buddhism are already underrepresented on the WH list (I can only think of Bodnath, part of the Kathmandu Valley WHS). None of the great monasteries have been designated, while Tibetan Buddhism is such an important feature of this region (Greater Tibet, Nepal, Bhutan, Sikkim, Ladakh). I think that the designated area of this WHS would improve by including the pilgrimroutes, like the Barkor kora or even the Lingkor kora. I visited Lhasa and the Potala Palace in August 2017. The Potola Palace was the residence of the Dalai Lama from the 17th century until the current Dalai Lama fled to India during the 1959 Tibetan uprising. During the Cultural Revolution, Tibet's monasteries were destroyed with dynamite and artillery and rare books and paintings were burned. By the end of the Cultural Revolution, nearly all of Tibet's 6,000 religious monasteries, temples and shrines had been looted, damaged or destroyed. Yet, Zhou Enlai, China's then Premier, personally intervened to ensure that the Potola Palace was not destroyed. I also visited Norbulingka, the traditional summer residence of successive Dalai Lamas from the 18th century until the current Dalai Lama exiled in 1959, and Chagpo Ri Rock Carvings, where more than 5,000 painted rock carvings of Buddhist images have been created over a millennium. I stayed at House of Shambhala in Lhasa's old town (http://www.shambhalaserai.com/html/House-of-shambhala-1.html), and my favorite meal was yak steak at Tibet Steak House. While I prefer to travel independently, western tourists are required to make Tibetan arrangements through a tour operator. I worked with Explore Tibet (http://www.exploretibet.com), and while Tibetan travel is more than twice as expensive as it would be if tourists were permitted to travel independently, my guide performed one valuable service in that he waited more than four hours to procure a ticket to visit the Potola Palace, where the interior rivals the magnificence of the exterior. Yes I visited Lhasa and the Potala With two friends in 2007. It was a powerful experience to finally stand and gaze up at one of the most impressive and spiritual buildings in the world. I asked where we could see the Tibetan flag and was told to ask in Nepal when we got there. The fountains were fun but the Chinese flag lowering ceremony and marching army band were not. I remember Tibet and it's people as incredibly beautiful but am very sad at what had and is happening to them. Read more from Sue Wright here. Visited the Palace as a side trip. Since individual travel is not permitted to the autonomous region, I was lucky to be part of an official delegation. Either that, or I join a tour group - which is usually overpriced. Impressive! The Palace has preserved the best treasures. Personally, the best "museum" I've seen in China. Tourist visits to Tibet have always been subject to the vagaries of the political climate both in terms of whether they were possible at all and in terms of what the atmosphere was like when one got there. Our visit in August 1994 coincided with a relative thaw for those days and was doubly lucky in that the first phase of restoration of the Potala finished in that month and this magnificent building was open for visitors. I remember that we had been warned about carrying/giving photos of the Dalai Lama – but there actually seemed to be plenty around even for sale in Barkhor St. The restoration was followed in Dec 1994 by the inscription of the Potala on the WHS list so perhaps the Chinese government was using “kid gloves”. 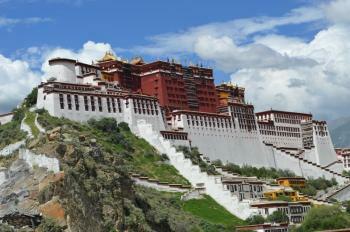 In any case the Potala is one of the world’s great iconic sites, should figure in every traveller’s “to see” list and justifies significant effort/spend to move it to your “seen list”!! It isn’t the “last word” in Buddhist monasteries – there are others in Tibet and in Ladakh which enable you to get “closer” to the monks and their rituals. Also, to a non Buddhist, a lot of what you will see is incomprehensible or inaccessible (even with a guide) – and perhaps even to many Buddhists if they are not followers of a Tantric school. But to anyone, the chance to see the obvious piety and joy of the believers visiting the Potala and its associated nearby site at the Jokhang Temple Monastery is itself a worthwhile part of the visit. At the latter site you will see pilgrims who have prostrated themselves and then moved forward the length of their body perhaps tens of thousands of times as a means of reaching their objective. The building, with its myriad of passages, chambers, courtyards, smells and chants will not disappoint – it seems even bigger when you stand directly under it than in the photos (eg mine) and once inside you will feel even more that you are inside some gigantic rabbit warren. But the Chinese are still restoring it in stages so in any one year significant parts may be closed – however, unless you are a specialist I would guess that one set of chambers and corridors will be much like another! It is also unfortunate that it is one of those world class sites where despite the history, the piety and the mystery, the conflicts of modern politics are always present and the mere act of going there can’t avoid taking on a political dimension. I just took the train trip from Qinghai to Lhasa. Due to the influx of tourists from this new train service, the visiting hours to Potala Palace is now only one hour, although they increased the daily inflow from 1,000 to 3,000 people so everyone can get a chance to see inside. The result is a rush through the palace, with barely sufficient time to take in the art and monuments. The tickets are officially 100 RMB (US$14), but scalpers ask for up to US$100. So plan carefully with your travel agent. One politically incorrect comment: While we see the current 14th Dalai Lama as a wise, benevolent, sagacious leader, the theocracy that ruled Tibet over the last 400 years were no angels. A system of absolute power over every phase of people's lives in a almost hermitically sealed region, with no checks and balances always lead to abuse of power. Look at what happened in the Catholic Church over history...men are men. It was a long awaited wish of mine to see the Potala palace in person and after several years of trying it came true in May 2007. It really is a breathtaking view and despite all the attempts of the Chinese government to profane it the Potala spreads out an overwhelming aura of spirituality. The neverending stream of pilgrims circulating round it underlines this spirituality. Late in the evening when the sky is dark and the Potala is lit by spotlights, they have a set of color-lit fountains on the huge square opposite the Potala to which they play classic evergreens such as the "Blue Danube Waltz" or the "Hungarian Rhapsody" loud but in poor quality. The whole scenery is then quite bizarre, a bit like one would imagine a Potala Hotel in Las Vegas. But even that couldn't take away the Potalas dignity. There is a lot of modern mythology surrounding Tibet in the outside world (outside of Asia especially). I found 'Demystifing Tibet' to be a good and frank introduction to the ineptness of the Tibetan government in response to change, and why and how China has interfered frequently to alter Tibet's behaviour to its own advantage. China behaves like a superpower to its satellite nations. It is however the Cultural Revolution that devastated China and Tibet beyond recognition. Traditional Chinese culture survives in the satellite Chinese societies of Taiwan, Hong Kong, Macao, Singapore and Southeast Asia. We returning Chinese find the mainlanders so alien to us, so empty and soulless. I live in Shanghai now, and it seems like Tibet is having their revenge. The current material prosperity has manifested deep spiritual emptiness among the Chinese. I regularly see lamas from Tibet, Kham, Amdo being sponsored to rebuild their destroyed monasteries by the newly rich Chinese, who turn to them to pray for their own merit and salvation. This relationship is not very different from that during the imperial times, where Tibetan monasteries received Qing imperial patronage. Same deal here. What I find sad is more the lay Tibetan farmers, nomands having no access to education which might actually give them a fighting chance with the more wiley, business minded Chinese. Tibetan theocracy was not very kind to Tibetans, if you actually are honest with yourself and do your research. Chinese materialism coupled with the rise of the monasteries again is just another poison. So much suffering. But I still love the rarity of light and air in Tibet. 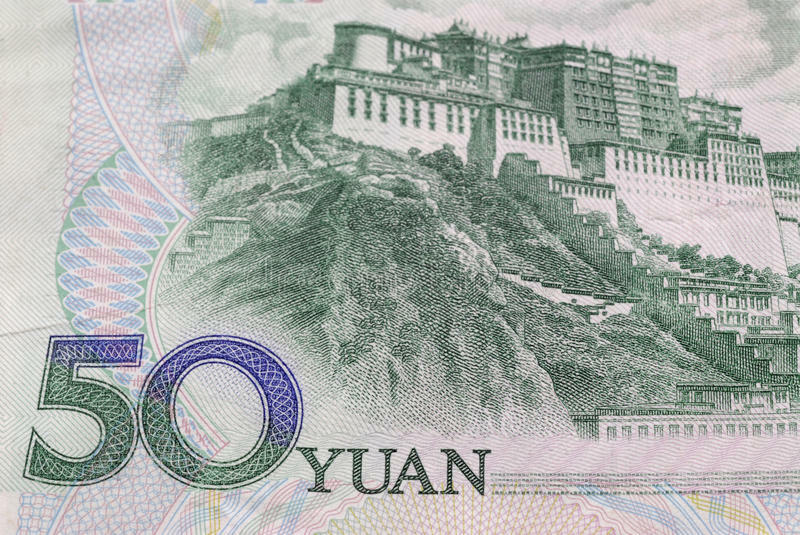 Potala Palace is a beautiful sight, and I cannot imagine a better form of retribution against the current Chinese government than a thriving Tibetan culture and well-preserved Tibetan architecture, culture, and religion in modern day Tibet. It is true that the Tibetan culture and people have been long oppressed and persecuted by the Chinese. But it is incorrect to solely present Tibetan people as long-suffering martyrs mericilessly oppressed by the Chinese. It is always incorrect to represent people as purely good or evil, especially people from cultures different from our own. Though their numbers may be small, there are unscrupulous Tibetans who have embrace capitalist opportunism in the thriving tourism industry. There are also Chinese soldiers who may sympathize with Tibetans and feel that their peers behave in a despicable manner. When we render people in black and white, we run the risk of losing objectivity in our assessment of people. It is especially easy to lose objectivity when dealing cultures different from our own. China and Tibet are each enshrouded in so much mysticism and mystery in the Western imagination. Though the Chinese army has committed countless atrocities against Tibetans, one can't believe that most soldiers of the Chinese army are socially cognizant, educated individuals who have made a careful decision to persecute Tibetans. Many of the soldiers in China's army are recruited from the countryside. Most of these men have barely a grade school education. Most have simply bought into the government's anti-Tibetan propaganda without question. Without the critical thinking tools of a formal education or a free press, these soldiers easily fall into the trap of brainwashing political propaganda. Not unlike Japanese soldiers conditioned to view the Chinese peasantry as sub-human during WWII, today's Chinese soldiers have been fed similar lies about the Tibetan people. The current actions of Chinese army finds parallels with the Nazis of Germany and extremist Hutus of Rwanda. I find it interesting that Jokhang is listed as a World Heritage site. While Jokhang is very significant, the present one in Lhasa is rebuilt. Original Jokhang or Tsuglakhang was almost completely destroyed by the Chinese invasion and during the Cultural Revolution. The complex was rebuilt in the 80s to the current state. I was in Tibet for about a month in Sept 1989. I travelled overland from Kathmandu to Lhasa. It was a difficult journey. Land slides had wiped out portions of the road on the Nepali side of the border, and it could only be travelled by foot. The overland route was barren and lodging and food primitive at best. We stayed overnight at chinese army posts some nights. Many in my group were very sick from altitude. When we finally arrived in Lhasa, it seemed like civilization, even though it is one of the most isolated cities in the world. I have many memories of the Jokhang. My travelling partner and I befriended a monk there and shared yak butter tea...of which I have many fond, and not so fond, digestive memories. (if you drank it too fast, your cup was quickly refilled...if you drank it too slowly, the butter congealed, and it was like cool grease....I actually liked the initial taste of the stuff, but a bit went a long way. The Tibetans drink huge quantities whereas I found a few sips my digestive quota. I could go on and write and write...how we were invited to share a festival at the Jokhang..I am trying to remember, I think it lasted 3 or 4 days...It was the first time the Chinese government had allowed them to celebrate this occasion in many years, and the monks were very excited. I have pictures of the tsampa and yak butter sculptures they made over the course of the days of the celebration. I think I even taped them chanting...I was on the upper level of the Jokhang and could be discreet with my camera and walkman. I remember having to escape for air (too much yak butter tea...and went into the market place at Barkhor. There I found these children selling tiny hot potatoes...just boiled or steamed...lovely...they wrapped them in a piece of cone shaped paper...a dash of salt...just what I needed to absorb all that butter floating in my belly! I still find comfort in tiny boiled potatoes when I'm ill..takes me back to that day. I actually have a photo of the "facilities" on the upper level of the Jokhang...to this day I still wonder how exactly the whole thing worked since there was no actual "plumbing"...I hoped it wasn't some poor monks "duty"...the idea of an upper level outhouse just made you ponder the logistics. My memories of Lhasa and Tibet are actually far less superficial and amusing than this portrays. Just in certain moments a sense of humour had it's place. I found your website by accident...I am looking for a large reproduction of the Potala Palace for my wall. I lead a wonderfully happy life...I probably appreciate it more than most because of what I have seen, but it has been a long time since I travelled. I'm now raising a family, and it's easy to become self absorbed. A glance at the Potala on my wall will be a reality check! My experiences help me stay grounded with the realities of the world...so as not to take my life for granted. Tombs: "In the Potala Palace, there are eight stupa-tomb chapels (where the relics of the Fifth, Seventh, Eighth, Ninth, Tenth, Eleventh, Twelfth, and the Thirteenth Dalai Lamas are preserved." Women Explorers: Reached by Alexandra David-Néel in 1924 when it was still "forbidden" -"The First western woman to enter Tibet". Spent 2 months there and "visited the monasteries"
Anglo Chinese Relations: Tibet was invaded by a British expedition under Colonel Younghusband in 1905 (primarily to counter Russian activity in the area since there were rumours that the Chinese govenrnment, which nominally ruled Tibet, intended giving it to Russia) and the Dalai Lama was forced to sign the Anglo-Tibetan Agreement in his apartments in the Potala Palace. Although China per se had not been involved it considered the invasion of one if its "client states" as humiliating. This led in 1906 to the signing of an an Anglo-Chinese Convention by which the British agreed "not to annex Tibetan territory or to interfere in the administration of Tibet", while China engaged "not to permit any other foreign state to interfere with the territory or internal administration of Tibet"
Ekai Kawaguchi: First reached Lhasa in 1901 from Darjeeling. Is said to have had an audience with the 13th Dalai Lama Thubten Gyatso (1875-1933). He stayed 2 years in Tibet including a period at Sera Monastery (not inscribed) - but eventually had to flee back to Darjeeling.